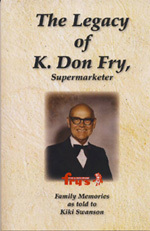 K. Don Fry has influenced the lives of many people, as the founder of Fry's Foods, as an employer of thousands and as a family man in Scottsdale, AZ. His life's story is now told in The Legacy of K. Don Fry, Supermarketer. The family has generously shared business and personal memories with local author, Kiki Swanson. Mr. Fry came from a small town in Oklahoma in the Dust Bowl years to the emerging agricultural state of California in the late 1930's. He had grocery and meat market experience and found his niche in selling fresh meat in El Sobrante, CA., at the northern edge of Oakland. His energy and new ideas brought him the opportunity to start his own business. This early success was cut short by the draft in World War II. He served in Europe in a tank battalion, a maturing experience he never forgot. When he returned, his duty brought him to Arizona in recruitment. His best recruit was Mollie who became his wife in 1945. A degree in Business Administration from U. C. Berkley led to the grocery industry and the founding of Fry's Foods with his brother Charles in the Oakland area. Together they forged a chain of stores that succeeded for over twenty years. Through mergers and acquisitions, Fry's Foods became a division of the Kroger Company. The California stores were sold, and 120 stores in Arizona now carry the Fry's name. This book is far more than a chronological report of success. Swanson has quoted many of Don Fry's written memos and newsletters. He was a prodigious gleaner of wisdom and good advice from other C. E. O.s. In some ways, this book could serve as a guide to those who are learning management strategies. Much of his advice is family-oriented, because his wife and family were number one on his list of "Things I am Thankful For." It is heart-warming to read eighty pages about a gentle, positive, honest, determined man who was usually in the background of family pictures, who visited the stores regularly and knew everyone's name, who spent ninety-two years loving and caring about people. Family pictures add to the warmth of the story. Kiki Swanson has written church history, fund-raising brochures and family sagas for many years. She says of this story, "I find myself celebrating and grieving right with the Frys as if they were my own family." The book may be ordered from the author or at Dog-eared Pages Bookstore 602-283-5423.